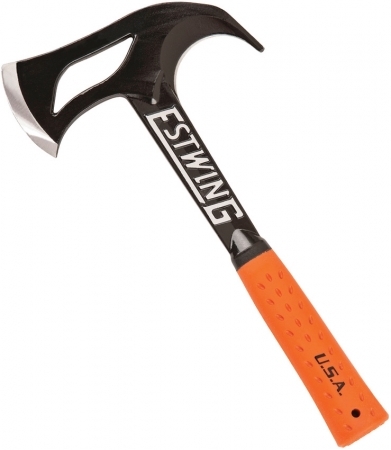 Construction: U.S. Steel; Color: Black; Overall: 13.5"; Blade: Stainless l Standard Edge l Powder Coated Finish; Handle: Orange l Rubber; Other Info: 2.875" sharpened axe edge. Patented shock reduction grip. Black nylon belt sheath. Includes sharpening stone. Hang Packaged.